Most text of the present article comes from the review published in the fifty seventh issue of the British C64 magazine ZZAP!64 (street date: December 21st, 1989). RESEARCH PROJECT: Binary code addiction as a means of controlling the world. HEAD SCIENTIST: Prof NORMAN NUTZ Phd, Bsc, KP. RESEARCH EQUIPMENT: C64, Amiga A500, Cray-2. Before anything else I must apologist for last month's intro -- it was exactly the same as the one the month before! So I didn't get the chance to tell you about what a lousy Christmas I had. I must also point out the mix-up was not my fault, the Geek muddled up my files because I didn't give him what he wanted for Christmas, ie a new leg -- well what's wrong with (a) second hand?! Last month, you may also have noticed that Ed nicked another of my reviews. If this happens again I'll have to give him urgent unanaesthetised brain surgery with a pickaxe! Onto this month, and only one review I'm afraid, but the Geek insisted on putting in some tips which got squeezed out of the last issue. 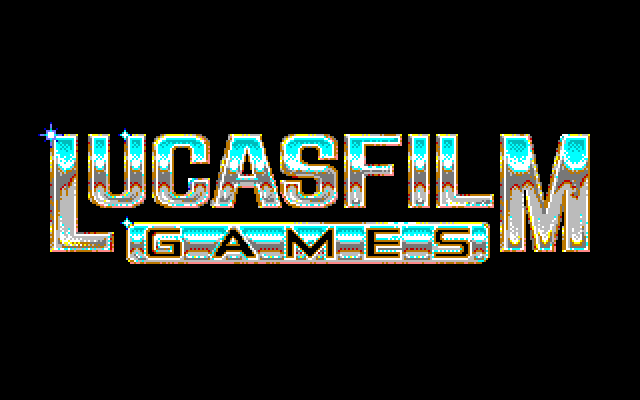 Next month I hope to have a full review of Future Wars from French software house Delphine, and the long-awaited Space Quest III from Sierra On-Line. Until then, I'll wish you a belated Happy New Year! ak McKracken was one of those games which all ZZAP! 's reviewers drooled over, a unique achievement for an adventure! Now the unique format has been updated for Indy: The Adventure Game and it took all my cunning, and the sneakiness of the Geek, to grab the review copy from the Welshman. 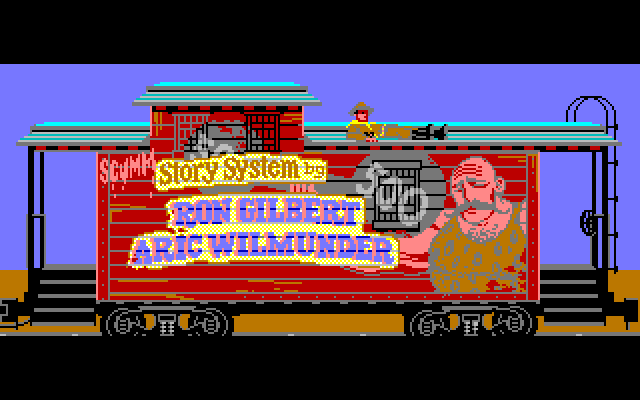 The game follows the structure of the film quite closely, with a number of arcade sequences included as well. A hilarious start sequence has Indy dripping wet from recovering the fabulous Cross of Coronado, trudging into Barnett College. After Prof Marcus Brody fills him in on some college news Indy is free to wander about, trying to follow in Harrison Ford's footsteps. People who've seen the film will obviously have a slight advantage, but lots of details have been changed so no-one's going to find it easy. After a visit to his student-filled office, Indy gets the yearning for the quieter life of battling Nazis. In any case, he is soon taken to see Walter Donovan, a wealthy industrialist. Donovan, like Hitler and quite a few real US industrialists of the time, has become obsessed with mysticism, mythology and archaeology; in his case symbolised by the Holy Grail, the chalice which caught the blood of Christ when he was on the cross. Anyone who now drinks from the Grail may live forever, Donovan believes. Indy's father was also interested in the chalice and has disappeared while looking for it on Donovan's behalf. Indy must now find both his father and the Grail. 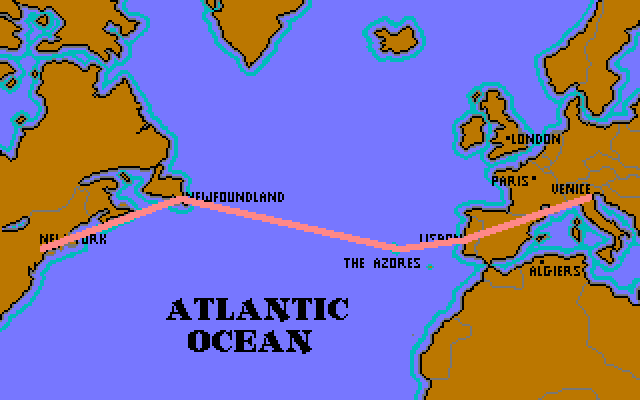 A plane is put at his disposal to take him to Venice, which is where his father was last seen. 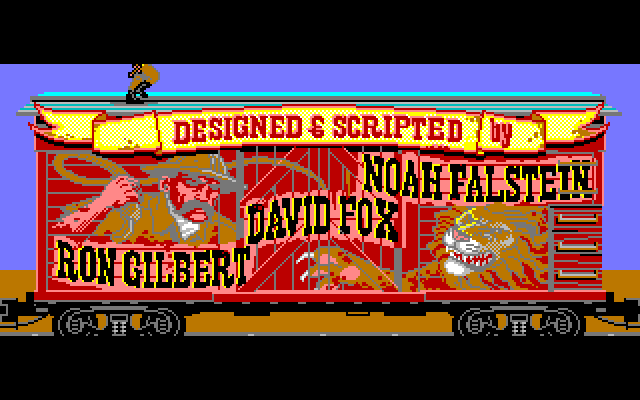 But first Indy must find his father's diary, which will provide invaluable advice on his quest. Finding the diary shouldn't prove that hard. 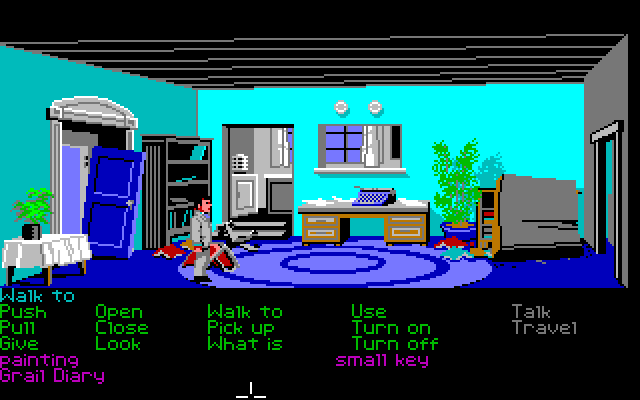 As in Zak McKracken, you move Indy around simply by pointing and clicking with the mouse. More complex actions mean you have to use the keywords at the bottom of the screen. 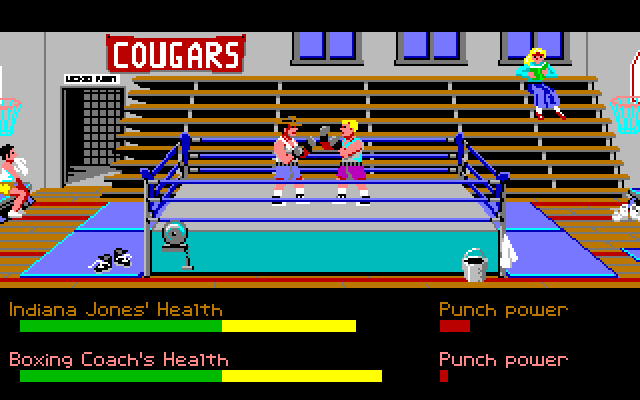 For example, to ring the bell in a boxing ring you click on 'Use', the word appears on the sentence line, and then you click on the object you want. In this case it's a mallet, resulting in the sentence 'Use mallet with'; click on the bell to put the word in the sentence, then click again to put it into action. It's all very simple, allowing a good deal of flexibility without vocab problems. 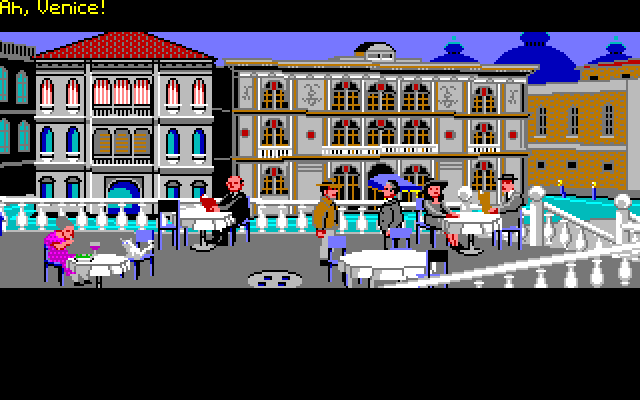 After meeting Dr Elsa Schneider in Venice, Indy must find his way into the catacombs to find the shield. Once near the catacombs' hidden entrance, the Grail Diary -- which loads in cryptic, but vital clues -- can be used. When you get in the catacombs the view switches to an overhead one, a tiny Indy figure moves around the maze with only a small area around him illuminated. With information from the catacombs Indy learns his father is being held prisoner by Nazis in a castle. Once in the castle you can get into fistfights with the Nazis in proper arcade fashion, although punches, blocks and movement is by keypad, not joystick. According to the instructions you can always avoid fights if you're clever enough, but they're good fun anyway. After freeing Dr Jones, Indy pays a visit to Berlin, then tries to escape Germany in a Zeppelin. But the airship turns around mid-flight, forcing Indy to escape in a plane. This leads to another sub-game, with a first-person perspective of the cockpit. While Dr Jones shoots at the German fighters, Indy must keep the plane steady. Eventually though, the plane's shot down. Then it's on to the Middle East, where you arrive in the Grail Temple to have another confrontation with the Nazis. 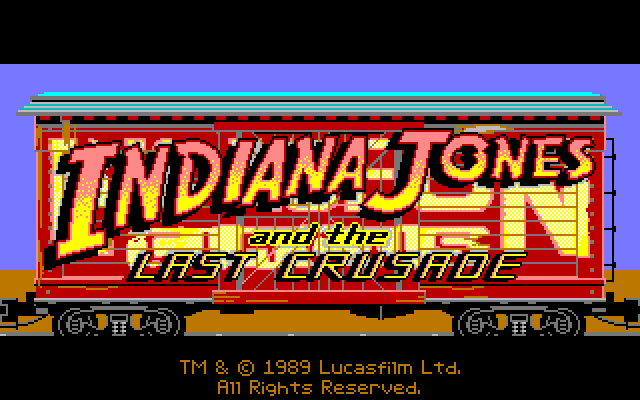 Like most 16-bit Lucasfilm games, Indy started out as a PC product, before being converted to the ST and Amiga. 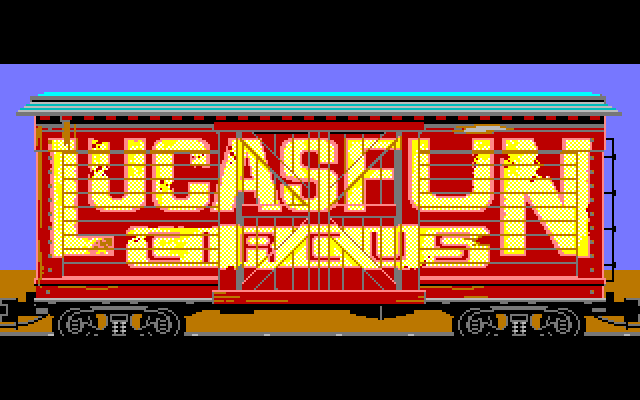 The graphics then are all quite attractive and nicely detailed, but make very little use of the Amiga. Sound is improved from the PC/ST, with some great samples such as the squelch of Indy's boots at the start, but the tunes are disappointing. 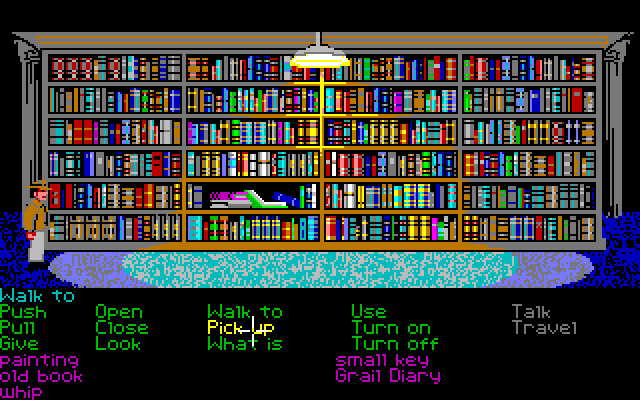 More importantly there's a good save feature, allowing you save over a dozen files to a blank disk -- but sadly no RAM save. 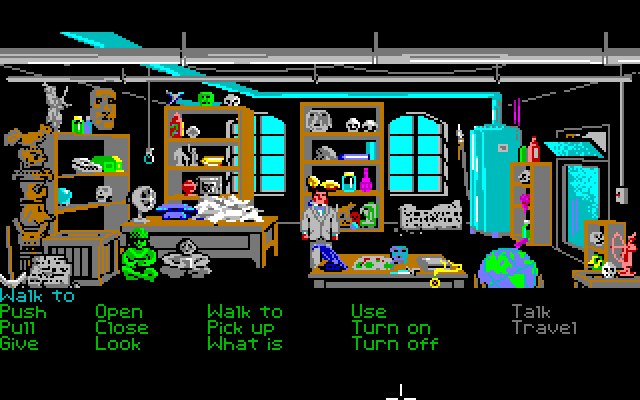 The game is great fun to play, with some good puzzles, although obviously not quite the depth of an Infocom game. Also, humour isn't quite up to the standard of Zak, but this is still an essential purchase for fans of the movie, and most adventurers as well.